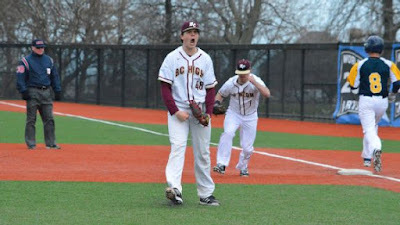 BC High ace Mike Vasil helped the Eagles clinch another Catholic Conference title with a no-hitter against rival Xaverian. Photo by Brendan C. Hall, via ESPN Boston. 1. St. John’s (Shrewsbury) (12-2; Last Ranking: 1) After losing in an extra innings marathon at Xaverian, the Pioneers beat three good teams with a 40-1 run differential. 2. Central Catholic (12-2; Last Ranking: 7) Going 10-1 in the minefield that is the Merrimack Valley Conference is extremely impressive. With Sam Lara and Steve Hajjar leading this staff, the Raiders appear to be Super 8 bound. 3. St. John’s Prep (10-4; Last Ranking: 2) Without star third baseman Mike Yarin, the Eagles aren’t able to outslug every team they meet, but they’ve still won several close games in the brutal Catholic Conference. 4. Methuen (10-2; Last Ranking: 10) All the Rangers seem to do is crush dreams, defeating Super 8 hopefuls Lowell and North Andover over the past couple of weeks to stake their own claim. 5. Lynn Classical (14-0; Last Ranking: 8) Dominant in the Northeastern Conference so far this year, it would be very interesting to see the Spartans match up with the state’s elite in the Super 8. 6. Braintree (11-4; Last Ranking: 3) The Wamps went through another midseason slump, but seemed to snap out of it midgame during a comeback win over Peabody. 7. BC High (8-6; Last Ranking: 13) Ace Mike Vasil spun a no-hitter as the Eagles clinched a second straight Catholic Conference title with a 2-0 win over Xaverian last Monday. 8. Peabody (12-3; Last Ranking: 22) If the Tanners had held on to an early 5-0 lead and defeated Braintree, they would be in prime shape for a Super 8 berth. As it stands, they’re still firmly in the mix. 9. Malden Catholic (9-5; Last Ranking: 14) Don’t look now, but the Lancers are riding a four-game winning streak that includes victories over conference rivals in Prep, BC High and Catholic Memorial. 10. Reading (10-2; Last Ranking: 25) When senior ace Corey Diloreto is on the mound, the Rockets are as tough to beat as any team in the state. 11. Walpole (11-4; Last Ranking: 20) Senior Brian Gaughan is clearly one of the elite arms in the state, as he struck out 19 over nine innings in a marathon 1-0 win over Milton last Monday. 12. Belmont (13-2; Last Ranking: 12) Aside from a narrow loss to Reading and a stunning loss at Arlington last Wednesday, the Marauders have done nothing but win. 13. Danvers (11-2; Last Ranking: NA) Falcons give Lynn Classical its toughest test of the year and could be primed for another run at a Division 2 state title. 14. Taconic (12-0; Last Ranking: NA) Running the table gives Taconic a decent chance to earn a Super 8 bid from out of Western Mass. 15. Newton North (9-4; Last Ranking: 17) The young Tigers continue to figure out how to win and will be a tough out in the state tournament. 16. Xaverian (8-7; Last Ranking: 11) Due to a brutal schedule and inconsistent offense, the Hawks are struggling to keep their heads above water. 17. Leominster (10-2; Last Ranking: NA) Wins over Wachusett, Shepherd Hill and Shrewsbury prove that the Blue Devils are one of the best teams in Central Mass. With at least a share of Mid-Wach A clinched, Leomister will now turn its attention to tournament seeding. 18. North Andover (11-3; Last Ranking: 4) Great pitching has carried the Scarlet Knights at times, but they might have lost too much offensively to top the best teams in the MVC. 19. Whitman-Hanson (10-3; Last Ranking: 16) Regional power Plymouth North halted the Panthers eight-game winning streak. 20. West Springfield (10-3; Last Ranking: 21) Led by University of Hartford commit Nick Dombkowski, who continues to dominate out west, the defending champion Terriers are in line for another deep tournament run. 21. Wachusett (11-5; Last Ranking: 12) The Moutaineers edged St. Peter-Marian for a huge resume-building win two weeks ago. 22. Lynnfield (14-1; Last Ranking: 18) A blip at Hamilton-Wenham in late April did little to disrupt the Pioneers rhythm, as they’re now on a seven-game winning streak. 23. Beverly (10-3; Last Ranking: NA) Panthers have won seven straight since getting edged by NEC powers Danvers and Lynn Classical. 24. Lincoln-Sudbury (9-3; Last Ranking: NA) They can beat up on the lesser teams in the Dual County League, but the Warriors stood little chance against the top-ranked SJS while suffering a 17-0 road loss 10 days ago. 25. Silver Lake (12-5; Last Ranking: NA) Despite uncharacteristic losses to Hingham and Oliver Ames, the Lakers remain one of the better teams in the South Shore region.